Biological anti-inflammatory drugs used to treat severe psoriasis have the potential to prevent heart disease in patients with skin problems. According to research published in Cardiovascular Research, after one year of treatment, the biological therapy improved the coronary plaque with an effect similar to that of a low-dose statin. Psoriasis causes patches and plaques of scaly skin, often on elbows, knees, scalp and lower back. Patients with psoriasis have a high risk of heart disease. Young patients with severe psoriasis have a double risk of having a first heart attack at 40-50 years of age. These patients also often have generalized inflammation that can be treated with anti-inflammatory biological therapy when their skin condition is severe and topical treatments or phototherapy has failed. This study investigated whether the treatment of severe psoriasis with biological treatment could improve the condition of coronary arteries. The observational study included 121 patients with severe psoriasis. Of these, 89 took biological therapy and 32 used topical treatment. 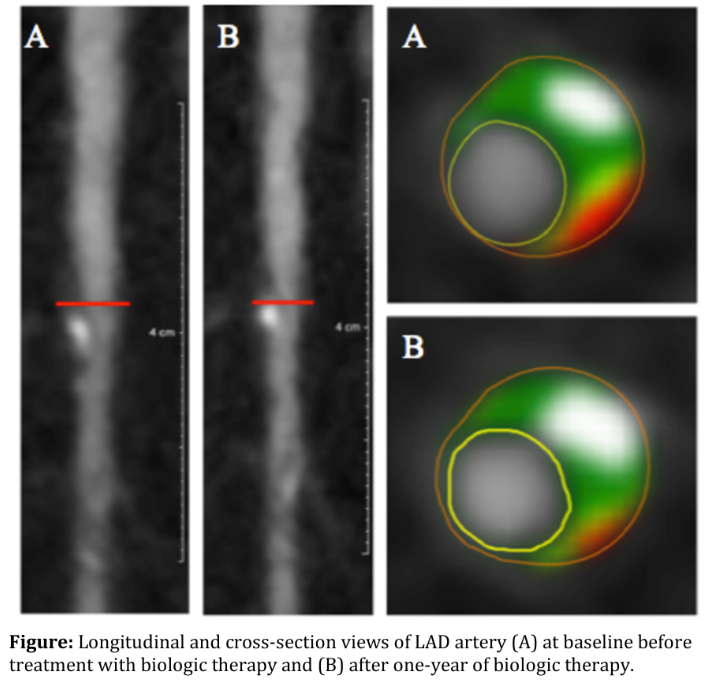 All patients underwent coronary artery imaging with angiography with computed tomography, at baseline and one year later, to evaluate the quantity and characteristics of atherosclerotic plaques. The study showed that patients with severe psoriasis treated with biological therapy for one year had an improvement in coronary plaque similar to the effect of a low-dose statin. Patients who have not taken biological drugs have shown a worsening of the situation. Dr. Nehal Mehta, the author of the study, said: "We found that these anti-inflammatory drugs commonly used to treat severe psoriasis can also improve atherosclerotic plaques in coronary arteries, making them more stable. This has occurred in the absence of changes in traditional cardiovascular risk factors, including blood pressure and blood lipid levels. During the one-year study, systemic inflammation assessed by blood markers was reduced only in the group under biological therapy. According to the research team, it is too early to say whether biological drugs exert their effects on coronary artery plaques directly or by reducing systemic inflammation. Dr. Mehta concluded: "This preliminary study provides the first evidence that biological therapy is associated with the reduction and stabilization of coronary heart disease, and justifies the conduct of a randomized study to test the impact of biological therapy on the progression of coronary heart disease in patients with psoriasis.